Strawberry. Basil. MARGARITA. Can I get an “oh heck yeah”?!? That’s right. I took summer’s best flavors – juicy sweet strawberries and peppery refreshing basil – and I mashed ’em up into summer’s best cocktail. Actually, I didn’t mash ’em, I blended them, but more on that later. I’d like to claim that I did this all for you, but no, friends, no I did not – I did it for me. And it was a very, very good thing I did for myself. The good news? YOU can get in on this action too! 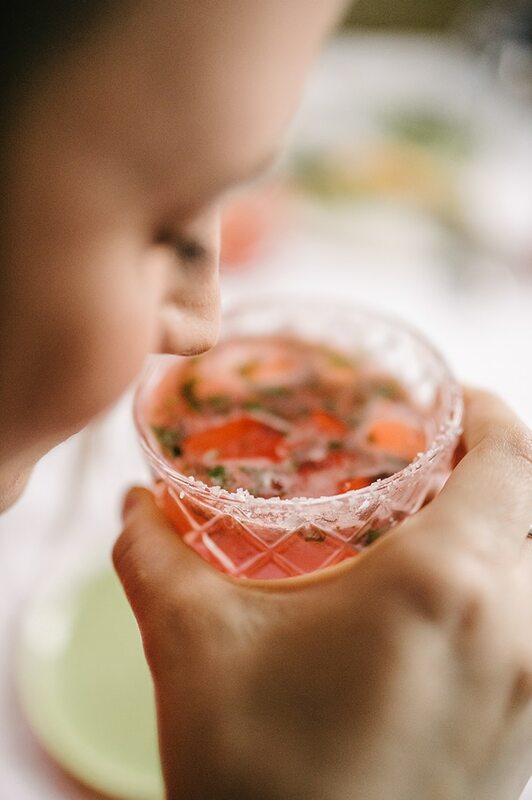 Be kind to yourself – make a strawberry basil margarita. You might be thinking “eh, too much fuss”. Why would I want to add strawberries and basil, when I can sip on the classic? Well for one – they’re pretty. Yes, that’s totally a reason. For two – they’re easy. 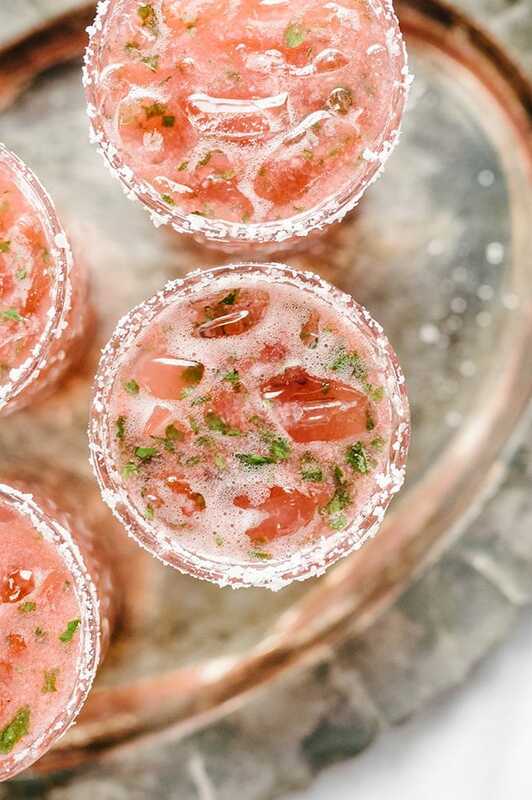 To transform a standard margarita into a strawberry basil margarita, you simply need a blender and a muddler. Easy peasy tequila squeezy. For three – you’ll bring all the friends to your yard/pool/table when you offer up a batch of these sweet, colorful and oh so delicious summer cocktails. Still not convinced? 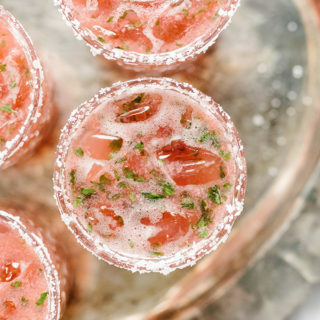 Let’s talk about the “health benefits” of this sweet summer cocktail. (Yes, I know what I did there with the air quotes, but indulge me). (3) Raw Honey = nature’s antihistamine. Well…sort of. The efficacy is controversial, but I reason that it can’t hurt. I start incorporating bits of local raw honey into our diet a few weeks before pollen season to lessen allergy symptoms (and given the intensity of this year’s pollen, I’ll literally put it in anything, as evidenced by this post). So there you have it. Delicious, fun, and (sort of) nutritious. Bottoms up friends. 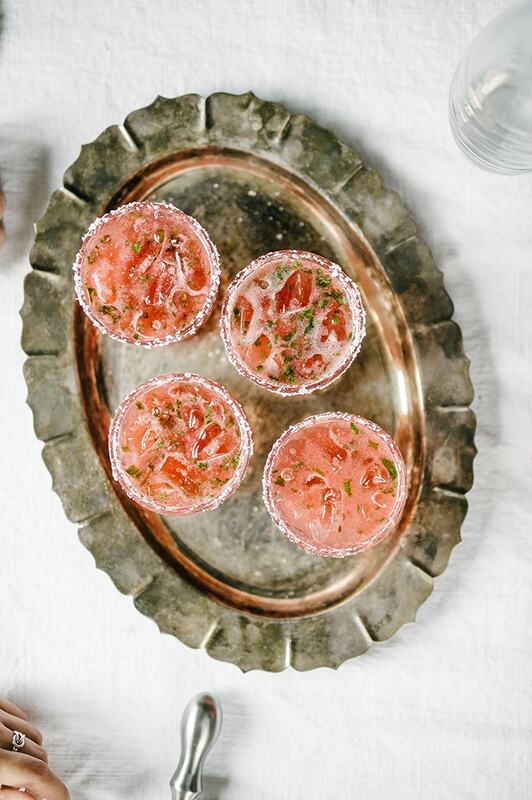 These guys are sweet and tart, but most importantly brimming with the most seasonally appropriate nectar-from-the-gods – no, I’m not talking about strawberries, I’m talking about the almighty tequila. Ahhh, tequila. When shot with lime it’s lover to all and friend to none. But stirred into this festive festive margarita, topped with the perfect amount of salt and poured over crushed ice? Yes, yes, yes. Get your hands on a bottle of tequila and pour some into a blender. Be generous but not a drunk. Add a handful of fresh strawberries, some cointreau, some lime juice, and some honey. No sugar needed! Now blend until the strawberries are totally pulverized. We’ve got the strawberry covered. Onto the basil! Put some chopped basil into the bottom of a cocktail shaker. Muddle. Pour the strawberry margarita base over the muddle basil. Stir…or shake. Do your thing. Then pour into a glass rimmed with salt and filled with. Sip…taste the summer…and enjoy it!